In case you are unfamiliar, November is known as NaNoWriMo month by writers. That stands for National Novel Writing Month. Each year, during the month of November, writers from all over the place take on the challenge of writing 50K in 30 days. It’s fun and crazy and makes you find writing time where you least expect it. Last year I participated in NaNo and won! Woot! That just means I got my word count to be at least 50K new words in November. In fact, that book I wrote last year is going to be my next new release! How cool is that? 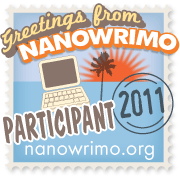 I have yet to decide if I want to participate in the craziness and fun that is NaNo this year. What 50k words would I write? ~Would I finish the wip I’m currently 45K into? ~Would I come up with a totally new novel and write that? Except for the fact that I don’t have a story in mind at the moment. ~Would I write the next Meadow Ridge Romance book I already have an idea for even though it will leave me short on the world count? Each Meadow Ridge Romance is between 30-40K. ~Would I do some crazy combo of projects?